Over the years I’ve written about some of the various ways that tea has made its way into fiction and here’s yet another example. It’s the recently released Tempest in a Teapot, by Amanda Cooper. It’s billed as A Teapot Collector Mystery and it’s apparently the first in yet another series in the popular field of whimsical themed cozy mysteries. 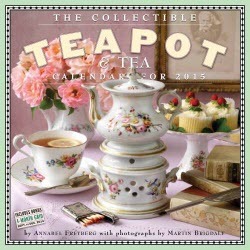 And while we’re speaking of teapots it’s as good a time as any to make a note on your calendar to pick up The Collectible Teapot & Tea Calendar 2015, by Annabel Freyberg and photographer Martin Brigdale. Speaking of tea and fiction, one of the better known titles that uses tea and yet has nothing directly to do with tea is due for a reissue later this year – when it will appear for the first time in a trade paperback edition. That’s The Long Dark Tea-Time of the Soul, by the late Douglas Adams, best known for his The Hitchhiker’s Guide to the Galaxy.